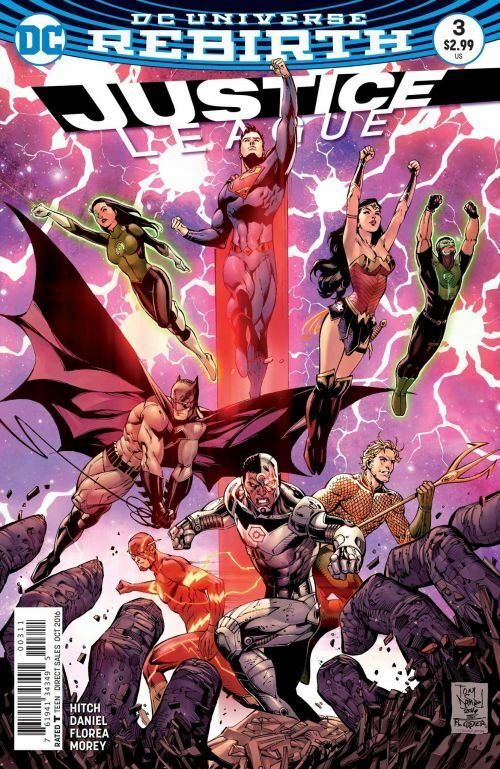 Well, I am pleased to say that with issue 3 Justice League has finally picked up some steam. Hitch continues with his storyline about the Kindred and the Purge, both threats to the people of the Earth, but also opposed to each other, with the Justice League trapped in the middle. The League continues to operate individually for the most part during this tale, though all of them are dealing with the situation, approaching it from different angles. Cyborg, Flash and the two Green Lanterns are dealing with the Purge insects, and the Lanterns head into space to find the remnants of the world they came from. Aquaman has his own arc, down in Atlantis, inspecting the Zodiac crystals. Batman is picked up enlisting Superman to head to the Earth’s core, in search of the extinction machines. This didn’t strike me as anything really dangerous for Superman, but it’s played well, and the threat built by the way Lois worries about her husband’s survival. Wonder Woman gets the best action in the issue, entering the body formed by the Kindred. Daniel and Florea do a great job with the Kindred, who have formed a glistening body comprised of humans that they have absorbed, and indeed the art throughout the issue is balanced and strong. It’s still just another middle chapter to the tale, with nothing resolved by the end. But Hitch seems to have more fun with the story, now that he is past the introductions and set-ups. The villains still aren’t that exciting, but the tale is fast paced, and a heart is given to the tale in the scenes with Superman, Lois and their son. And for the first time, I am actually looking forward to the next issue.